Café at the Corner in Hapeville GA is a small French bistro that is open for lunch only. Hapeville is a little town near the Atlanta airport. You know that the food must be good when a small town restaurant on Main street is only open for a few hours each day. When I arrived at the restaurant with my lunch group, the line was snaked around in front of the food counter. There were so many delicious choices that the 10 minutes waiting time was almost not enough for me to make up my mind. And most of that time was spent trying to decide what dessert I wanted. 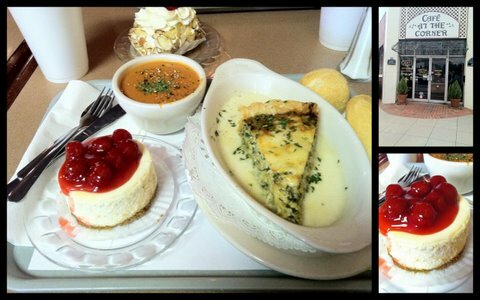 I decided to order the tomato bisque, spinach quiche, and cheesecake topped with cherries. This was some of the best tomato soup I have ever had. It was creamy. The coarse cracked pepper on top added a little crunch and explosion of pepper flavor that goes well with the tomatoes. The spinach quiche was well put together and the crust was flakey with the right amount of cheese sauce. All of the meal was leading up to my favorite part: dessert <insert applause and cheers here>. The cheesecake was rich, smooth, with perfect texture. It was not too sweet. There were more cherries than the cherry filling, which was a plus in my favor. One of my lunch companions ordered the cake topped with frosting and almonds (seen in the picture at the top). I wish I could have tasted her cake because it looked so scrumptious when she was eating it. And it did not help that she was making sound effects like "Mmmmm this is so good". I thought about asking to taste her cake, but I did not want to offer a taste of my cheesecake. I decided to leave that alone and the next visit here I will try the Almond cake (don’t know the name of it but that is what I am calling it). Overall: I really enjoyed eating at Café at the Corner. I did not expect such delicious food in this small town next to the airport. But now that I know about it, I am glad it exists!